I have severe non-stop neck and shoulder pain that started 2 weeks after starting cipro. The pain is located only on the left side from the bottom of my hairline down about 4 or 5 inches and then the pain goes out toward the left about 6 inches. I have had this pain since Feb constant throbbing. It does not make the pain worse to move my arm,shoulder or neck in any direction or position. I also have humps and dips across my shoulder. I have mentioned that i think it could be possible that Cipro did this damage to the 5 or 6 drs i have seen for this problem. They all look and me like i'm crazy and act like that would not be likely. Well actually most of them have never heard there is a problem. The urologist said drug companies just list everything that could possiblly happen. I also wanted to mention i have been suffering since 03 from another pain in my left rib area for 6 years. i was surprised when i check my pharmacy record i had taken cipro the month before that pain had began. Please let me know if you think that sounds like neck and shoulder pain that could have been caused by cipro. Sorry to hear you're having pain issues. There's no way I can say for sure whether this is from Cipro or not. One of the big clues, though, is the onset of pain directly after taking a fluoroquinolone like Cipro or Levaquin. This pain can show up anywhere, and depending on the amount of damage it does, causes a Process of Inflammation. say a lot on that topic....little of it good. When you say 'humps and dips' do you mean there is swelling, and the skin is kind of pitted? Meaning, it looks like you poked your finger in in a few places and the hole never filled in? That was a good catch, by the way, no notice the correlation between earlier Cipro use and pain symptoms. Tendonitis by itself can be tough to deal with up in the shoulder area. When the damage is from Cipro or Levaquin, it gets even tougher. Hopefully you're in the category of people that hurt for a good long while, and then the pain goes away. The other category at this point in time looks like 'permanent' damage. I still believe that there is a cure out there, we just haven't found it. You may be interested in taking the test as described on the Levaquin Tendonitis Treatment page. Maybe I can help you identify the source. 1. History of pain or injury in this area? 2. History of car accident or falling down the stairs or similar impact accident? 3. Daily activity, like work or exercise, that you have done regularly over time. This includes recent changes of routine. 6.Why did you take the Cipro? Answer those questions, that will give me a more clear picture. Comments for Is My Tendon Damage Pain Caused From Cipro? PART 2 - Response - Is My Tendon Damage Pain Caused From Cipro? Exactly. It all began with a sore pain going straight up the left side of the back of my neck. I went to the chiropractor for the neck pain. He wanted me to get adjustments 3 times a week to start with, after a few adjustments the pain started to get severe. It was not long before the worse pain was in my shoulder. 1. History of pain or injury in this area? No neck or shoulder pain prior to taking cipro. I sit all day at my job. I usually alternate a lot between the phone (i use a headset) the computer, reading paper reports and talking to patients. I have not been exercising at all and was not at the time the pain began. No change in routine. Thanks for all that Michelle. Well, your job could certainly be the culprit for the pain up the back of the neck, but the swelling, pitting, the continued increase of pain, and shoulder too....Cipro could certainly be the culprit. Especially in the sense that the tendons/connective tissue were compromised, the nervous system was on high alert, and then the chiropractor did a fast, forced adjustment. Your nervous system would not like that, not at all, combine with that the compromised tendons/connective tissue could have torn, adding injury to insult and injury. 1. I would keep things gently moving, even if it hurts. Keep yourself as mobile and flexible as possible without hurting yourself. 2. I would get the Organix Profile test as described on my Levaquin Tendonitis Treatment page. It's totally worth it to get anyway, healthwise, and some say that Cipro and Levaquin cause Tendonitis and injury because there is a nutritional or other factor at that level that puts one more at risk for taking floroquinolone damage. 3. I would increase your water intake, and start eating Bone Broth as the best Tendon Supplements. 4. I would NOT let the chiropractor go jerking around on my neck. 5. I would ask any other questions you may have, because this response definitely did not contain everything you may want to know. PART 3 - More questions - Is My Tendon Damage Pain Caused From Cipro? I have been searching for someone that would be able to let me know if cipro could have been the cause of all my pain. Also i have been searching for someone that knows how to treat this problem. You are the only Person that has researched this problem and has any knowledge or treatment plan for this very painful problem. Thank you so much for caring, you do so much more than what your job requires of you. I have seen four doctors for this problem i could tell they were clueless about how to go about treating this problem i feel that they should have at least done a little research. I have two questions the 1st i want your opinion my shoulder did not have the thing that looked like someone had stuck their fingers in and it left an indention until after the sports medicine dr did the trigger point injections. I told him that i had read that steroids coud cause the tendon to rupture. He act like he was insulted i questions him and said it was a small dose and there was no cause for concern. The other thing the drs think it could not be a damage tendon from Cipro since i can use my arm on that side with no limited movement. It does not hurt much worse with movement. My neck and shoulder just throbs all time 24/7. What do you think about that. Thanks so much for your help I am sending off for the testing. PART 4 - Is My Tendon Damage Pain Caused From Cipro? Hello Michelle, thank you for the kind words. The fact is, everybody is clueless. But some people are -really- interested in finding out what the problem is, and a lot of people aren't ready to admit that the drugs they give may be dangerous. Along those lines with the trigger point injections doctor...insulted that you would imply that the shot -may- have done something not so good. What could possibly go wrong with a needle being forced into your tissue and then forcefully injecting fluid into the constrictive space?? (the tone of sarcasm there). Surely that doctor knows that corticosteroid injections/needle can cause tendon damgage just with the puncture, and surely he knows that the corticosteroids themselves are known to cause tendon injury/degradation (kind of like eating away at the tendon structure like acid, kind of). So I admit I'm clueless, and Kerri is clueless, but we have a working theory and are willing to start looking for the CAUSE. I think the Organix Profile test I gave you the link to is the best place to start. And you have to start somewhere, because there just is NO cure, or any good remedy out there, really. Some things will help some people, but for people with the permanent, long term damage....there just isn't. 1. I think it's GREAT you are going to get the Orgainx Profile. 2. I think the shot could have caused and/or aggravated a problem, certainly. 2. From the shot or the Cipro, you can have damage and/or a tendonous (or related connective tissue) pain dynamic. What happens if you lift your arm 20 times, or against resistance? Did they just have you lift your arm once? Say more about that. PART 5 - RESPONSE - Is My Tendon Damage Pain Caused From Cipro? Responding to it should hurt more to raise the arm. It hurts more to raise my arm than it does to let it rest. I can push up against resistance. After raising my arm 20 times it hurts each time i raise it, and more than it was before raising my arm. When doing these motions there is not enough change in pain that i would think would be significant to say there is a problem. I always think when drs are asking if it hurts you move your arm to a position they want to either know if it causes unbearable pain or if its impossible to move in that position. It seems like most of the time it just throbs about the same no matter what I'm doing. I hope I'm not going to be in more trouble now about 10 days ago i got botox injections. I have not got significant relief. PART 6 - Is My Tendon Damage Pain Caused From Cipro? It does hurt more doing those positions these but not unbearable. My dr wants me to have a mri of shoulder. do you think i should have one. I it a possibility the knots on the shoulder that look like fingers that mashed it down and did not come up could be something like cysts? Could be something like cysts, or abcesses, but if you have swelling and inflammation, I'd put my money on 'pitted edema'. Which is swelling with dents. PART 7 - botox - Is My Tendon Damage Pain Caused From Cipro? The botox injections where given in the muscle right above my shoulder blade. I was given 10cc in several different areas. It was supposed to force the muscle to relax. What type of Dr do you think could best determine if the tendon was damaged by the cipro. If the problem is from cipro I want to get in on the class action suit. The time limit is running out. I am terrified of having this pain the rest of my life, just like the side pain i have had for 6 years. I think Cipro caused that pain. All of the Dr.s I have seen totally avoid even discssing the issue. The best kind of doctor would be one that is willing to concede that people can get injured from fluroquinolones. Like you said, most doctors avoid the topic, brush it off, don't understand it, don't keep up with the latest research or anything other than what the pharamceutical companies provide them, fear lawsuits if they delve into it, etc. There is no test that I know of that directly identifies Cipro or Levaquin damage. There are indicators and factors to look for, but nothing definitive. I'm looking into the lawsuit thing. I'm usually not into the lawsuit thing, but I'm all for it in regards to Cipro and Levaquin damage. I'll get back with information soon. PART 8 - cipro - Is My Tendon Damage Pain Caused From Cipro? That would be great I am afraid that if this is damage from cipro I will be in terrible pain the remainder of my life, I feel if there is a class action suit i should qualify. I would be eternally greatful for your help. You seem to understand the kind of pain I have to live with. I had a prostate infection on two different occasions. In both cases I was prescribed cipro. In both cases I had neck and trapazoid pain that drove me to a doctor and physical therapist. My pain is gone. I only connected the problem to cipro after having read about cipro. That's GREAT news that you have not pain now. Is your prostate infection bacterial, fungal, or viral. If it's not/wasn't bacterial, Cipro can't -really- help as it's an antibacterial. Point being, people can take a lot of damage from Cipro, -and- have recurring infection. You might want to make sure of what's what in the future. As I said, it's great the neck and traps pain went away, but personally, I wouldn't like my chances of continued use. Does CHELATION THERAPY help Cipro and Levaquin Tendonitis? Joshua I am still in pain after taking Cipro in 2003 AND 2009, thinking about Chelation therapy. Do you think it could help? Sorry to hear about the Cipro side effects. Chelation therapy is a treatment versus heavy metal poisoning. Levaquin and Cipro doesn't cause a heavy metals problem. Chelation therapy may actually make your pain worse because it removes minerals from your body (and that's what the Cipro did!). You want to put minerals back IN! They add vitamins and minerals when doing Chelation, not sure how effective it would be. Sure don't want to be in more pain.Practioner said he has cured a man with the Levaquin poisoning. Well it certainly makes sense that adding vitamins and minerals. But the chelation itself isn't going to help quinolone poisoning per se. Which isn't to say that that you/the cured person/etc don't have issues that the chelation can help with. Not sure if we're talking about the same thing: 'Chelation therapy' takes things OUT. Something like 'chelated magnesium' is a type of vitamin/mineral. So if you're being given chelated minerals, that's different than 'chelation therapy'. Which of those two are you talking about, so we're on the same page? 1. What kind of practitioner are you talking about? 3. See if that practitioner can do glutathione or IV Vitamin C.
(Cullman, AL) I also started having pain just like you describe after taking Cipro. It started the day after my 1st dose. I had severe burning nerve pain that started at my hair line on my right side and went up into my head and face also down my shoulder. I have been off Cipro for a few days now and the pain has improved greatly. Wow! I stumbled onto this site today and Michelle's experience could be mine. I was prescribed Cipro on six days ago for a UTI. I am a healthy, active 56 year old woman with no medical history and who takes only a daily multi-vitamin. I started the Cipro on a Friday; I woke up Monday morning with significant pain on my left side from the hairline down through the shoulder. I thought I'd slept wrong so used a heating pad through the day and took both Aleve and Advil (which I now know was a mistake) to relieve the pain. It is now day three and the pain is no better. It was only last evening that I learned of the possibility of tendon damage caused by Cipro. I also have found information on a possible connection to the jaw/tooth pain- also only on the left side of my mouth and Cipro. I've scheduled an appointment with my PCP for tomorrow. I'm in considerable discomfort but am afraid to take anything without advice. Any help is SO appreciated. "Would it make sense for me to start on a magnesium supplement? "can I use these medications safely now since I've discontinued Cipro (last dose was last night?)" Unfortunately I can't give a definitive answer on that. Personally, I wouldn't just in case. 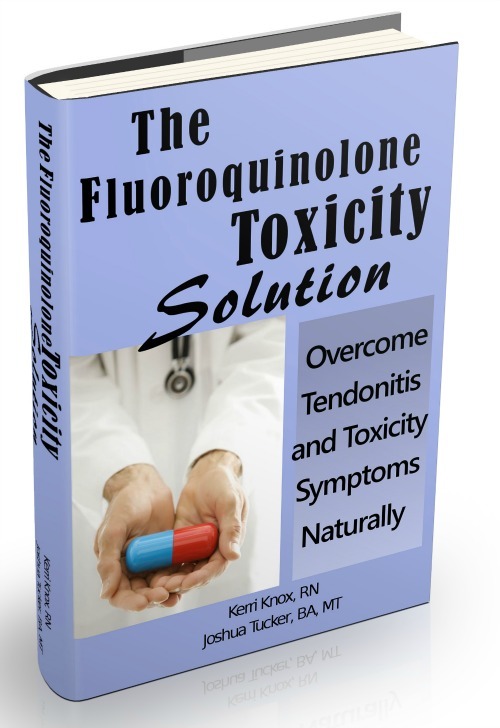 As a rule I direct people to The Fluoroquinolone Toxicity Solution (formerly The Levaquin Tendonitis Solution). It is the complete guide to understanding and dealing with Cipro (or any other fluoroquinolone). Your particular scenario may not be a big deal, but my advice to anyone suffering cipro side effects is to position yourself as if it is a big deal. Tips and tricks are a disservice to anyone in your position. Magnesium, absolutely and immediately, and as that may or may not be adequate to deal with your complete picture/situation, personally I wouldn't leave it at that to 'see what happens'. Again, it might be enough to turn the direction of things, but if it's not, you probably don't want to waste the time/effort waiting to see. I hope that conveys my thought adequately...let me know if you have any questions. Hi,I'm 56 years old,and recently took Cipro for a post op infection. My left Achilles tendon ruptured years ago, and I just had a complete vasectomy because of that injury. I started having pain in my left shoulder shortly after taking the Cipro,but was unaware of the connection between the Cipro, and tendons,so I was on Cipro for several weeks before I made the connection. My shoulder is so painful that it's hard for me to even brush my wash my hair or put it in a ponytail. Does this pain ever go away? As far as the shoulder pain. In my experience, withought doing anything effective for it, it will either go away within a year...or it won't (meaning never). So I suggest you get on the program and get to work with it. No sense waiting around and hoping it will go away...that would be 6-12 months of time wasted that you could have been doing the right things to get your body healthier/working better again post-Cipro.